So you have a cool blog with a sizeable readership. Excellent! Have you thought about the ever-growing number of people with smartphones who want to read your blog? It is quite easy to make your blog available to them. You can install the wptouch plugin that will add a new theme to your blog, making it look like and work like an iPhone application. This enables the iPhone, Blackberry, Android and other mobile phones users to consume your blog posts easily, while on the go. Check this mobile web site design blog (www.webile.co.uk/blog/) from your phone to see an example. If you are hesitating to tinker with your blog, we can install and activate the plugin for you for a nominal $25 per blog. Get started by just giving us a few quick details in the form on the right. Are you tracking the terms that people are searching for, using the site search option of your website? These can give vital clues to the keywords that you are not targeting clearly on your home page. Say I have a blog that talks about my web design service. Now if I discover that lots of people are searching for ‘prices’ through the site search option, I will get a signal that lots of people are interested to know what kind of prices I charge. If I make this aspect of my service clearer on my home page, I will be able to retain and may be convert more of my visitors into prospects. An easy way to track this statistic is through Google Analytics. Yu should edit the site profile option and activate the site search option as shown in the picture here. 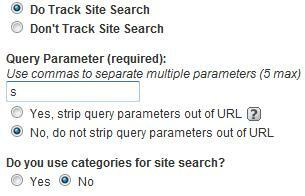 Click on the ‘Do track the site search’ option and then enter ‘s’ in the query string parameter. Save the settings and Google Analytics will now start tracking the site searches for your blog. Do you want your blog to rank higher in the search engines? Did I hear a loud ‘Yes, of course!’? Link 1-2 times to your money pages (main site, sales pages) with keyword-rich anchor text. Vary the anchor text – don’t use the same text always. Link to other posts in the blog. This increases the number of incoming links to those pages and improves their ranking potential. The links should be included in the main content. Sidebar links carry less weight. Use the main keyword at the beginning of the post title and a variation near the end. For longer posts, use H2 and H3 tags in the sub-headings to break up the posts. Have a juicy introduction para that draws a causal visitor in to the post. Have a nice summary as the last para with a powerful call to action, sending the visitor to the main sales page. Keep your blog software updated. The new versions include features for better SEO, while providing more security against hackers. These quick-to-implement tips will definitely give your rankings a nice boost. Please share your experience with other fellow readers. Short URLs with Semiologic – easily! If you have a Semiologic blog, you don’t have to use a short-url service like TinyURL where you can’t change the destination later. This is also great for the control freaks who are very scared to use a 3rd party service. I verified that the redirect manager plugin was activated. You can activate it if it is not activated. Then I added a new page. I gave it a short and direct name – Semiologic. I entered nothing in the content area and scrolled down to the lower side where there was a box for the redirect URL. Here I entered the destination URL. That’s all. Now if I type www.rentablogger.com/blog/semiologic, it gets redirected to my reference link for Semiologic blogging system. This is a 301 redirect, comes with my blog URL and therefore promotes my brand instead of the URL-shortening service’s brand. If I ever had to change the target URL, I can easily do so from my site. Note: If you don’t want to have this page included in the Sitemap, you should tick on the options shown here. Do you know Google is now giving less weight to run-of-site links (the ones you put in the sidebar or footer, available on all the pages)? It is much better to link to your favorite sites from the content – the blog post itself. The reason is simple – we won’t think much before putting a link to a golf-training guide on a dog-related site’s sidebar. However the relationship has to be much closer if we were to link to it from the content. Thus it is fair to assume that a link from the content is a closer-in-context link as well as lesser likely to be a spam link (mass link exchange or paid-for link). And search engines tend to treat this as a more valuable link. How To Keep The Visitors On Your Blog Longer! Use the related posts plugin to show a few related posts just after your blog post. This way when a visitor has finished reading your blog post, she gets to see a quick list of some more posts on similar topics. Hopefully she will find one of these interesting and go ahead and read that. Then she will get another list of related posts and … you get the message. It is quite easy to accomplish this on a Semiologic blog. Click on Appearance | Widgets. Choose “Each entry” in the dropdown in top-right side and click on show. Add the Related widget from the list of available widgets (middle column list). The widget will be added to the list of widgets being used in each entry. Click on Save changes. The settings are saved and the list shows again. Now drag and drop the Entry: Actions widget to the end of the list. This is done to make sure that the related posts do not appear to belong to the next entry. Click on Save changes again. You are done. View the blog to see the effect. Now your visitors will be staying on your blog longer than before. If you don’t feel confident you can pull it off or are strapped for time, we can apply these SEO changes to your blog for a nominal feel. Contact us! Blog Post Title – Did you think before you posted? Did you know that your blog post tiles are very important for the SEO of your blog? There are some simple but important considerations to get your post (more) popular. Are you doing it the right way? Are you making these mistakes <in your whatever>? Or some other question? You will notice that Wordpress or Semiologic will create a slug from your title that will become part of the URL. You should edit this to take out all sundries like did, or, of, the etc while keeping the meaning intact. Think newspaper headlines. Study how they create a meaningful sentence with the minimum words. As a final tip (only applicable if you are using Semiologic or a SEO-plugin enhanced Wordpress), edit the title of the page. Normally the title of the page (the meta-tag, not the headline) is same as the blog post title. You can edit this to score well on the SEO front while retaining a different blog post title. You can see the image on the left to see how you can enter a specific set of meta tags for each post. If you use Semiologic as your blogging software (I call it Wordpress on steroids), make sure you enter a keyword rich and attractive title for the home page. The blog generally defaults to displaying your blog description as the title of the home page, which is not such a great idea. 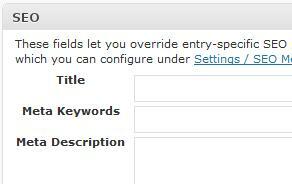 In admin section, you can click on Settings and then choose SEO to enter a title and some other parameters for the home page. I have got a nice improvement in rankings of some of my client blogs by this change alone.